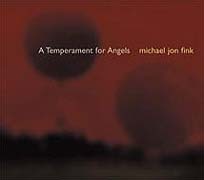 A Temperament for Angels (28'24") is Michael Jon Fink's fascinating study of harmony. Fink uses, for the most part, conventional acoustic instruments like those found in a chamber ensemble, and with these instruments, realizes compositions at the edges of conventionality. This piece begins with a single string being bowed slowly. The sustaining note is joined by another, and another, until a full musical chord is formed. Notes are added, then subtracted, raised or lowered an octave - ever so slowly. As the tonality of this piece gradually shifts between one of harmony to one of dissonance, and back, it is obvious that the composer's emphasis is on the nature of transformation. Throughout, Fink establishes congruous sonorous scales, then corrupts them into explorations of dense harmonics. Overtones form as frequencies clash and resolve. Quite compelling are the few moments when two notes are played in unison, the slight detune creating a wonderful tension. At times all 16 parts are playing fully only to metamorphize into a single deconstructed dirge-like note, then slowly rolling on again like an enormous ground-swell of sound - the dense fullness of amplitude contrasting the more diffuse passages. The piece concludes with the low rumbling of gently scraped cymbals, the work's only completely atonal moment. While A Temperament for Angels may share some of the attributes of Ambient Music, one does not play this music as something to be experienced on the fringes of perception. There is an inevitability to this work, which goes beyond the process of minimalism. This music has been designed to stimulate the active mind and touch the spirit. Fink has created an intense transitory work, akin to something large and enigmatic moving through twilight.